Ace Hoffman's Nuclear Failures Reports: If you think nuclear power is safe and clean (like the President does), think again (like the President should)! If you think nuclear power is safe and clean (like the President does), think again (like the President should)! Subject: If you think nuclear power is safe and clean (like the President does), think again (like the President should)! President Obama thinks he can jumpstart a new generation of safe and clean nuclear power plants. Nuclear power is neither safe nor clean, nor cheap, nor useful, nor vital, nor good for America. And no "new" nuclear power plant design will make nuclear power any of these things. There are "safe, clean" ways to obtain electrical energy for everybody. Obama paid them lip service in his State of the Union speech last month. But he is actually giving billions of dollars to nuclear power -- a gift from each of us, whether we like it or not. Many of us don't like it, and the rest of us might want to understand why not. Obama's nuclear funding bill is being presented as a jobs program, but since nuclear-related construction jobs average higher salaries than many other jobs (including photovoltaic or wind turbine installation jobs -- which still pay pretty well), you get fewer jobs created for every dollar invested. And more of the money goes out of the country, too. Many major parts of any new reactor, including many of the largest steel forged pieces and a lot of the electronic control hardware, will be made overseas, in dozens of different countries. Nuclear power plants are NOT "Made In America." Once the plants are running the jobs are worse than ever: Every employee at a nuclear power plant is under stress not to be the cause of some trillion-dollar, million-death accident. And not to get themselves too irradiated to be allowed to work at the plant anymore. This stress actually causes them to lie about their mistakes. Everyone is in "cover-up mode." Employees hide things from their managers for fear of retaliation, and everyone hides things from the federal inspectors. Since on average there is about one inspector on site for every 500 employees, they miss nearly everything that actually happens... When the inspectors do see problems, they help hide everything from the media and the public. 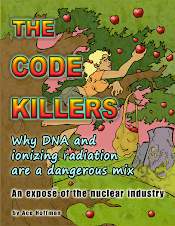 It's a dangerous cycle of lies and cover-ups and it happens at EVERY nuclear power plant. To make matters worse, the official policy is that the nuclear industry is largely a "self-regulated" industry. The nuclear industry does not get inspected by the normal government agencies such as OSHA -- the Nuclear Regulatory Commission handles everything, due to special laws just for nuclear power plants which keep the other federal agencies out. State agencies have little or no jurisdiction, either. The courts have abdicated responsibility, too. They say that the Federal regulators can make the decisions -- that nuclear power is too complicated for the courts to understand, so anything the NRC and/or the Department of Energy (DOE) says about nuclear power is considered to be the truth. There's no arguing in court with an NRC or DOE ruling! More scientifically accurate information will not be considered, and experts (even if you could afford them) cannot appear before the court to support your case. Nuclear power plants all over the country -- at least 27 of our 104 operating reactors -- are leaking tritium into our water, soil, and air. Tritium is "a marker for other radionuclides" and a very hazardous radionuclide itself. It's worse overseas, of course. Here, bribes like those my former Congressman (Randall "Duke" Cunningham) accepted will (or at least might) land you in jail, as it did Cunningham. In China, where more nuclear power plants are being built than everywhere else on earth combined, such bribes are a routine part of the process and no large project moves forward without them. But the punishment -- if the Chinese government decides you should be punished -- is likely to be death. Here in the United States, to move a bad project forward, you have to dupe the public, using persuasive advertising and anti-environmentalist propaganda by people such as Patrick Moore, whose brief stint at Greenpeace has forever branded him -- to some people -- as a "good guy" who speaks for the environment. In fact, Moore has been well paid to speak for earth-plundering corporations for decades, culminating in years of financial support directly from the Nuclear Energy Institute (NEI), the lobbying, advertising, and media outreach arm of the nuclear industry. Each year, Moore is quoted in hundreds of articles, endorsing nuclear power. And virtually every time, his decades-old Greenpeace connection is mentioned (and usually inflated), but his current NEI connection is not. How did America get to the point where it would even consider building a new generation of nuclear power plants? In China you can blame all kinds of things, including a lack of any semblance of democracy. But in America, blame a lack of education first. Go out on the street and randomly ask people to describe what "tritium" is. Will one in one hundred even be able to say: "It's a radioactive isotope of hydrogen"? Not a chance! Maybe not even one in one thousand. This lack of basic knowledge among the voters makes it very easy to dupe the public. One of the most abused principles of government in America is that the voting public should be properly informed about the issues. But, even the president is not properly educated about nuclear issues and won't let those with the proper knowledge have access to him. The nuclear corporation CEOs, of course, can walk right in. And the waste -- let's not forget about the waste issues. The Yucca Mountain scientific team was told they could study AND SUGGEST TO CONGRESS any alternative if it was technologically better. The only thing they were forbidden from spending time and money considering was doing the same sort of underground, monitored storage in a different location -- Kansas, for instance, or Alaska. The Yucca Mountain team looked at all the things that Obama's new committee is going to look at. Rocketing the waste to the sun, putting it in underwater subduction zones, vitrification, on-site storage -- everything. As to reprocessing, that's just a lousy -- and expensive -- idea. The most lethal part of the waste is NOT the uranium or even the plutonium. It's the radioactive isotopes of elements which mimic biologically-useful isotopes of those same or similar elements. These are mostly beta emitters with relatively short half-lives -- the newly-radioactive results of the nuclear reaction. Radioactive isotopes of things like strontium (which the body treats like calcium), iodine, and hydrogen. When you reprocess the waste, you don't eliminate these things, you just separate the uranium and plutonium (for bombs, if you want bombs) from them. So reprocessing, even if you can reuse some of the uranium, doesn't solve the waste problem. Additionally, reprocessing is chemically very polluting as well as invariably creating a new and very expensive clean-up nightmare. The slightly new reactor design that Obama wants the taxpayer to fund -- the "AP-1000" -- which the nuclear industry chooses to call Gen III, practically guarantees cost over-runs. For example, they designed a less expensive containment dome, but the new design is untested and might not work (it's been described as "metal plates between layers of concrete" instead of a mesh of rebar embedded in the concrete). It's cheaper to build now, but will it last 60 years or 80 years, and THEN work when it's needed? Where will the money come from, that these loan guarantees guarantee? From the Feds -- that is, from the taxpayer! The funds will be distributed through banks, so they can make a profit on the transaction. Without government guarantees and government money to invest, those banks would not put one red cent into nuclear power. Many of the cost overruns will probably be paid by the ratepayers. And we'll all pay for accidents out of our own pockets and with our health. Liability for catastrophic nuclear accidents is practically zilch, thanks to the Price-Anderson Act, an archaic law allowing government to evade responsibility for its crimes. All countries operating nuclear power plants have some form of the Price-Anderson Act -- it's especially useful for evading responsibility for damage to neighboring countries. In Obama's new nuke bill, a few million dollars has even been set aside to fight activist lawsuits. They feel a drop in the bucket is all it will take to fight the truth, probably because they know how many things are already stacked against us: The courts, the federal agencies, the corporations, the money. But one thing Obama has clearly already miscalculated is how many people think this is a bad idea. Around the country, environmental groups which have been relatively quiet on the subject of nuclear power are decrying Obama's nuclear madness. And even the economic watchdogs are speaking out loud and clear: This is no jobs program! This doesn't solve our energy problem! It doesn't solve our balance of trade problem! It certainly doesn't solve our nuclear waste problem (it makes it worse), and it doesn't solve anything else. The way to solve the over-use of fossil fuels is with renewable energy, not nuclear power.